BDC pricing can be volatile and provides opportunities for investors that have identified proper values based on risk versus returns. Timing is important when investing in BDCs for many reasons including general sector volatility, opaque reporting standards and being largely retail-owned. Most BDCs have reported calendar Q4 2016 results and there were a handful with disappointing performance. It is important to realize that BDCs do not report consistently, so investors need to look beyond changes to NAV per share and dividend coverage from NII. Most business development companies ("BDCs") have reported calendar Q4 2016 results and there were a handful with disappointing performance. Timing is important when investing in BDCs for many reasons including general sector volatility, opaque reporting standards and being largely retail-owned, especially for lower quality BDCs. The opaque and inconsistent reporting for BDCs often results in retail investors making poor decisions. Focusing on simple coverage of the dividend with the previous quarter net investment income ("NII") is not enough. Also, just because a BDC is trading below net asset value ("NAV") does not imply a cushion for investors and is basically meaningless especially for poorly-managed BDCs with continual declines in NAV and dividends. In my article "Investing In High-Yield BDCs And Why Timing Matters: Part 2," I provided examples of what to look for when analyzing dividend coverage potential using Medley Capital (NYSE:MCC) and THL Credit (NASDAQ:TCRD). 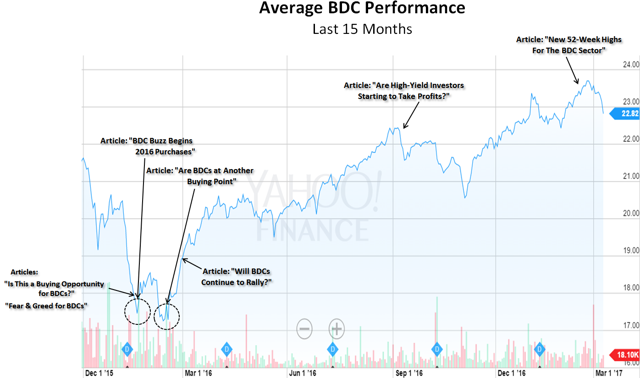 January 13, 2016 article, "Is This a Buying Opportunity for BDCs"
January 18, 2016 article, "Fear & Greed for BDCs"
January 23, 2016 article, "BDC Buzz Begins 2016 Purchases"
February 10, 2016 article, "Are BDCs at Another Buying Point"
September 11, 2016 article, "Are High-Yield Retail Investors Starting To Take Profits?" February 12, 2017 article, "New 52-Week Highs For The BDC Sector"
As mentioned in previous articles, I closely watch BDC, corporate bond and treasury yields as well as the changes in spreads to assess BDC pricing. The following chart shows the effective yield of the BofA Merrill Lynch US Corporate B Index. It is important to note that yields for this index have ticked up during the month of March. 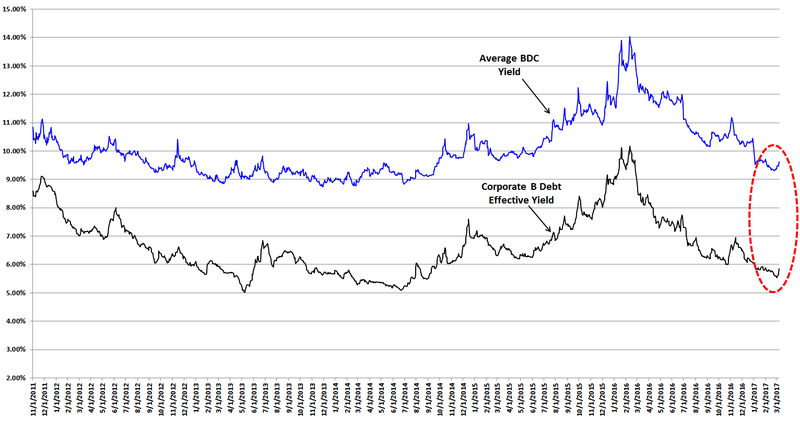 Historically, BDC yields (and corresponding prices) have followed B yields as shown in the chart below. BDC yields are currently on the rise, which means potentially lower stock prices. Over the last two weeks, the average BDC is down 3.5% but Horizon Technology Finance (NASDAQ:HRZN), TICC Capital (TICC), Triangle Capital (NYSE:TCAP-OLD), FS Investment Corp. (NYSE:FSIC-OLD), Prospect Capital (NASDAQ:PSEC), PennantPark Investment (NASDAQ:PNNT) and BlackRock Capital Investment (NASDAQ:BKCC) were down more than the average. As anticipated in my article "High-Yield ETFs Vs. Higher Yield BDCs: Yield Spreads," TICC and BKCC have recently announced dividend cuts that contributed to their lower pricing. For all previous articles on dividend coverage potential, risk rankings, interest rate discussion, expense ratios, the timing of BDC purchases, suggested BDC portfolios, my upcoming/historical purchases and current positions, please see "Index to Free BDC Research." 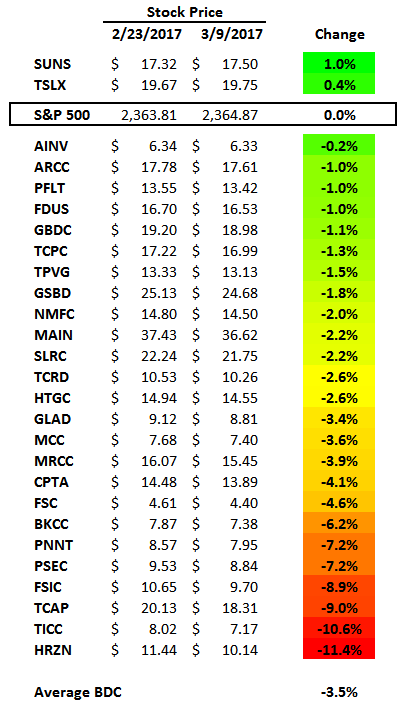 Many of the "safer" BDCs outperformed, which is typical during BDC pullbacks including Solar Senior Capital (NASDAQ:SUNS), TPG Specialty Lending (NYSE:TSLX), Ares Capital (NASDAQ:ARCC), PennantPark Floating Rate Capital (NASDAQ:PFLT), Golub Capital BDC (NASDAQ:GBDC), TCP Capital (NASDAQ:TCPC), Goldman Sachs BDC (NYSE:GSBD), New Mountain Finance (NYSE:NMFC), Main Street Capital (NYSE:MAIN) and Solar Capital (NASDAQ:SLRC). Upcoming Volatility: Lower or Higher? Establish appropriate price targets based on relative risk and returns (mostly from dividends). Be ready to make purchases during market volatility, and look for opportunistic buying points using limit orders. Closely monitor your BDCs, including dividend coverage potential and portfolio credit quality. Personal note: I have updated my positions to reflect changes in my holdings, but please keep in mind that some of the positions are very small and mostly for research purposes. There are over 50 publicly traded BDCs and I try to cover as many as possible but I do not have the bandwidth to include each company for each article. Disclosure: I am/we are long ABDC, AINV, ARCC, BKCC, FDUS, FSC, FSFR, FSIC, GAIN, GARS, GBDC, GLAD, GSBD, HCAP, HTGC, MAIN, MCC, MRCC, NMFC, PFLT, PNNT, PSEC, SAR, SLRC, SUNS, TCAP, TCPC, TPVG, TSLX. I wrote this article myself, and it expresses my own opinions. I am not receiving compensation for it (other than from Seeking Alpha). I have no business relationship with any company whose stock is mentioned in this article.